For various reasons you may need to go to the Sejong Office of Education (세종특별자치시 교육청), whether it is to sign your contract or as a meeting point for a business trip. Luckily it’s not too far away from the 욱일 (Ook-il) area where most of the expat teachers are based. You can either walk, take a taxi, or take the bus from Sejong. From Ook-il apartments walk past Paris Baguette away from the train tracks. Walk straight to the end of the road until you get to the big road. LG Best Shop will be on your right. Turn left, and walk straight. You will pass Tonkatsu Club on your left and Shabu Hyang on your right. Keep going until you get to the big intersection with a covered bridge crossing the road. Turn left at that intersection. The Office of Education is the first big building on your left. Daedong Elementary School (대동초등학교) is next to the Office of Education. 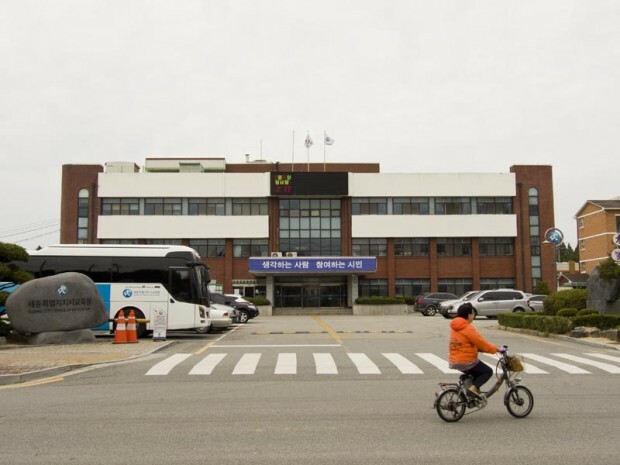 Go to the taxi stand by Ook-il apartments and tell the driver “Daedong Chodeung Hakkyo ga-joo-say-yo/대동초등학교가주세요.” When you arrive, you will see the Office of Education right next to Daedong Elementary School. On bus 601, 550, or 500 get off at 죽림리 (Juk-lim-ri), just one stop after Homeplus. Cross to the left hand side of the street, and stay on the left going past the roundabout and Kmart. Keep walking straight until you get to a big intersection with a Nonghyup bank on your right and a large church across the street. Turn left at that intersection and walk down that road. 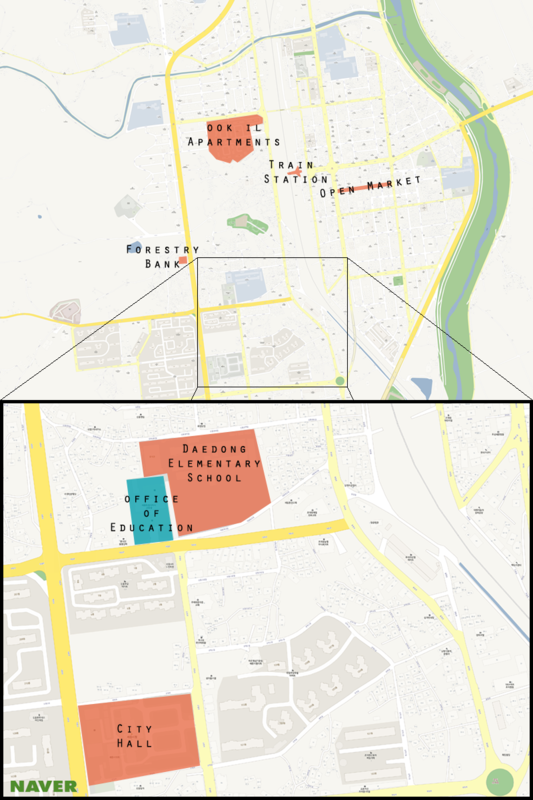 The Education Office will be on your right just past Daedong Elementary School. On bus 991 get off at the stop 대동초등학교 (Daedong Cho-deung hak-kyo) walk back in the direction the bus came, turn right at the corner. The Office of Education is just beside Daedong Elementary School on the right side of the road. On bus 620, instead of going by Homeplus, the bus will go straight and then turn right underneath a pedestrian bridge. The bus will then go past the Office of Education taking the next right up a slight hill. As soon as it turns, press the bell and get off at 세종 시청 (Sejong Shi-cheong/City Hall) and walk back in the direction the bus came. Cross the road and the Office of Education is to the right.